How do I install the latest Aladdin/SafeNet drivers from the command prompt? If you have an Aladdin MemoHASP hardware key and PTW refuses to start or the hardware key light continues to blink, you must manually install the drivers from the command prompt. Step 1 - Remove the USB key from the computer and uninstall any previous MemoHASP drivers. It can be uninstalled from "ADD/REMOVE Programs" in the Windows Control Panel. Step 4 - Click on the Windows "Start" menu, navigate to Run, and type in CMD. 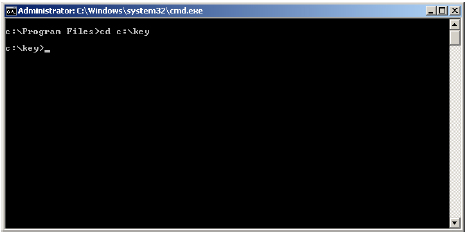 If you are running Windows Vista or 7, you can bypass going to the Run command and type in CMD in the Search box. Click on "OK" or press Enter. Navigate to the C:\Key by entering "cd C:\Key" and press Enter. Exit out of the command prompt. Remember to restart the computer after the above procedure. The USB key can be plugged back in after the computer has booted up.